This is for sign in only. If you would like to enroll in our $23/6 week special, please scroll down to enroll. Thank you! 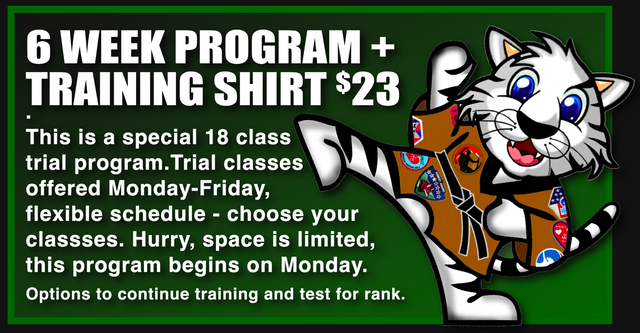 Celebrate our 23rd year Anniversary with the 6 week, 18 class special for youth groups. Classes begin next week. Class schedule: Monday, Tuesday & Wednesday 6:30pm, Thursday 6:15pm, Friday 6:45pm. Choose any 3 classes per week. Classes may be made up within the 6 week period.